The Republic of Turkey is located at a point where the three continents making up the old world. Geographically, the country is located in the northern half of the hemisphere at a point that is about halfway between the equator and the North Pole, at a longitude of 36 degrees N to 42 degrees N and latitude of 26 degrees E to 45 degrees E. Turkey is roughly rectangular in shape. The actual area of Turkey inclusive of its lakes is 814,578 square kilometers, of which 790,200 are located in Asia and 24,378 in Europe. Turkey has a population 67.8 million (as of 2002 data). 66% of them live in cities and towns. Istanbul, the most crowded city of Turkey, has 15% of the total population of the country. In terms of population, Turkey is the second largest country in Europe. Turkey has 81 administrative provinces and seven geographical regions. Turkey is generally divided into seven regions: the Black Sea region, the Marmara region, the Aegean, the Mediterranean, Central Anatolia, the East and Southeast Anatolia regions. The uneven north Anatolian terrain running along the Black Sea resembles a narrow but long belt. The land of this region is approximately 1/6 of Turkey's total land area. Although Turkey is situated in a geographical location where climatic conditions are quite temperate, the diverse nature of the landscape, and the existence in particular of the mountains that run parallel to the coasts, results in significant differences in climatic conditions from one region to the other. Turkey is democratic, secular and social state governed by the rule of law; committed to the nationalism of Atatürk and based on the principle of the separation of powers; a) Legislative power: The Turkish Grand National Assembly, b) Executive power: President and the Council of Ministers, c) Judicial power: Independent courts and supreme judiciary organs. 99% of the population is Muslim. Turkey is the only country among Islamic countries, which has included secularism in her Constitution and guarantees complete freedom of worship to non-Muslims. The history of Turkey comes from the Seljuk and the Ottoman Empire. The Turkish Republic was established in 1923, following the demise of the Ottoman Empire. The Empire had been in a state of decline for several centuries. Inability to keep up with industrial and scientific developments, social and political unrest and wars had sapped its strength. The First World War, in which the Ottoman Empire took part on the losing side, signaled its end. As the Empire crumbled, its Turkish nucleus rose up in a War of Liberation against the invading powers and the Sultan’s government. It was successful and resulted in the Lausanne Peace Treaty of 24 July 1923, which established the international status and boundaries of the new state. The Republic was declared on 29 October 1923. Today Turkey is accepted as a moderately developed country. It has signed a customs union agreement in 1995 with Europe for free trade of goods and the government hopes to be a full member of the European Union. Turkey is a republic established in 1923, and consists of 7 geographical Regions and 81 provinces. The Republic of Turkey is a democratic, secular and social State governed by the rule of law. The Turkish State, with its territory and nation, is an indivisible entity. The official language of the Turkish State is Turkish and its capital is Ankara. Sovereignty is vested in the nation without reservation or condition and the nation exercises its sovereignty through the authorized organs as prescribed by the principles laid down in the Constitution. Local administration is the system of administration established to meet the common needs of the people living in a specific region and managed by bodies elected by these people. Local administrative agencies are authorized by the central government agencies to introduce rules and meet financial obligations on matters related to the region. Municipalities, provincial local governments and villages are the three types of local administration operating in Turkey. During the Republican period, a special system was adopted for Ankara in 1924. Later on, the law of April 3, 1930, based on the French system, prescribed in detail the organization and functions of the municipalities. The governor, the representative of the central administration, is also the head of the provincial local government and its chief executive. The governor usually acts in line with the decisions made by the provincial general assembly. All municipalities are public corporate entities. Municipal organizations must be set up in all provincial and district centers. Municipalities are required to meet the common regional and civic needs of the region and the regional populace. Municipal administration comprises an assembly, a council, and a mayor. The past of the land registration organization in Turkey goes back to 150 years ago. The first Land Registration Organization was established in 1847 to perform transactions concerning real estates. This organization lasted when the Republic of Turkey is founded. The first established records have been intended for only property and land registry transactions. No works have been done concerning maps, establishing and updating cadastral surveys during that period. After the Republic of Turkey was founded, establishing an independent Land Registration organization was given importance on, because this matter required special experience and its scope was broad. For this reason, the General Directorate of Title Deed was founded in 1924. The first cadastral office was established by a law in this organization in 1925. Modern cadastral works were started by applying Land Registry and Cadastre Law numbered 2613 in 1934. This Law was generally applied to determination and registration of real properties in city areas. On the other hand, another Cadastre Law numbered 5602 was came into force to complete cadastral work of agricultural areas in 1950. Then this law is updated and applied to real properties of villages in order to fulfill their cadastral maps and land registration. In 1987, these laws are combined and only one Cadastral Law numbered 3402 was put into force for the both area of City and Village. Today, cadastral works are being executed by using this Law. To indicate the real properties onto plans by establishing national cadastre. To determine and to follow applications of principles which are coordinating and developing land registry and cadastre and mapping services related with land registry and cadastre. In Turkey, the General Directorate of Land Registry and Cadastre, which is under the Ministry of Construction, is authorized to regulate the basis of rules of cadastral surveying and mapping affairs. The Land Registry and Cadastre has been making large-scale maps in the scale of 1/5000, 1/2000, 1/1000, 1/500. Also the mapping department of Provincial Bank is recognized as another organization which is making topographic maps at scale of 1/1000 for some of the needs of the municipalities. Each organization has their own archives in graphical forms (maps) but only a very limited amount is in digital form. The Organization under administration of Director General with its central organization constituted by 13 departments forming main service, control, supporting and advisory units has provincial organization which is constituted by 15 Regional Directorates and 1001 District Land Registry Directorships and 313 Cadastral Directorships under the supervision of Regional Directorates. There is no private sector involvement in land registration and in first cadastral surveying works. However, private sector can involve in some land parcel based works (local subdivision, land readjustment, consolidation, etc) after the first cadastral surveying only. The Directorate of Land Registry and Cadastre is responsible for all tasks related to land registry and cadastre. There are 14,000 persons employed in Directorate General and 5,500 of these staff are employed in the Land Registry activities and 8,500 of are employed in the cadastral activities. 1055 Land Registry Offices, spread out all the provinces and sub-provinces throughout the country, are tasked to perform contract and registration transactions concerning all real estates, to keep land registry books regularly and the government will be responsible for all the damages arisen from keeping such registers according to Article 917 of the Civil Law. There is no individual licensing system in Turkey but there are two necessities for cadastral surveying professionals working in the cadastral system. One of them is graduate degree of ‘Department of Geodesy and Photogrammetry Engineering’ (4-year bachelor degree) the other one is to became a membership of Turkish Chamber of Surveying Engineers. There are two main education categories for cadastral surveying professionals in Turkey. Under the 7 (seven) universities, Department of Geodesy and Photogrammetry Engineering (offering 4-years bachelor degree) is the main education part. About 500 graduates totally finish their studies annually. The other education body is College of Map Cadastre (2-years education). These colleges are under 24 universities and about 2000 students finish their studies annually. Turkish cadastral systems based on the legal system. But land taxation is also one of the purposes the system. The cadastre in Turkey is to keep public registers for real estates, to make and update cadastral registers and maps, to assist land related projects and to make large scale topographical base map of the Turkey. From this context the cadastre has also multipurpose role, especially providing information for local land planning and development activities too. In Turkey, the cadastre covers both urban and rural areas entirely. Demarcation of forest areas are realized by Forest Cadastre Commission only. Both private and state land ownership is been in land. On the other hand, there are a lot of problems with informal or illegal settlements. Especially in big cities and the areas where the state land ownerships are been intensively, informal or illegal settlements could be arisen to 50%. The main unit is a land parcel and a registration book which linked by a unique land parcel ID. Each village in cadastral region and each quarter in municipality border is cadastral working area. Cadastral working area divided by blocks surrounded by natural or artificial border such as road, way, highway, railway, arc, lake, sea. After measurements and circumscription of parcel completed, property ownership is determined. Documentation such as tax and title deed information is useful to indicate and determine owner ship. Also cadastre directorship considers explanation of head official of village or quarter, and expert witnesses by using rules of the cadastral codes. While determination of ownership, minutes of real property is prepared. All parcels boundaries are surveyed and systematically identified by means of separate designation on a large scale maps, forming a unit together with the related registers. These registers conveniently show for each property the legal situation of every right in reality and also relevant data with regard to the nature, accurate location and size of property. The area, type and owner of a real estate property are shown in the land registry books as well as rights and liabilities concerning the relevant real estate property such as servitude, mortgage and other explanations. So, the purpose of cadastre is to establish ownership rights in land and to make cadastral maps according to the provision of the Turkish Civil Law. As a result of such works, the geometric positions and legal status of the plots are determined. It is a parcel registrations system which based on boundary surveying process on the field. All legal rights which parcel has including landowners information are registered on the registration book under the given parcel ID. There are great efforts to digitize land registry and cadastral information since year 2000. In addition, all cadastral measurements have been digitally collected with (X, Y) coordinates since 1987. Digital data collected from land directly transferred to the digital environment and after the edit process based on measure sketch they are plotted out with plotter. Up to now each Land Registry office is individually trying to computerize their land registration books’ information. It would be said that most of the land titling information has been computerized in Turkey. Cadastral maps consist of graphical features (parcels boundaries, polygons, landmarks, etc. ), parcel ID, coordinate tics, text for some features (street names, etc.) and sheet related information (pafta index, approving the sheet, etc.). Land Information System initiatives are new studies in Turkey. There is no one responsible institution at national level. However, there are Urban Information System studies in some municipalities that cover land information system studies partially. Therefore, cadastral maps are mostly required by municipalities in order to implement local zoning plans and establish an urban information system only. 1. Land registry and cadastral information largely are not in digital form that can serve to other institutions. 2. 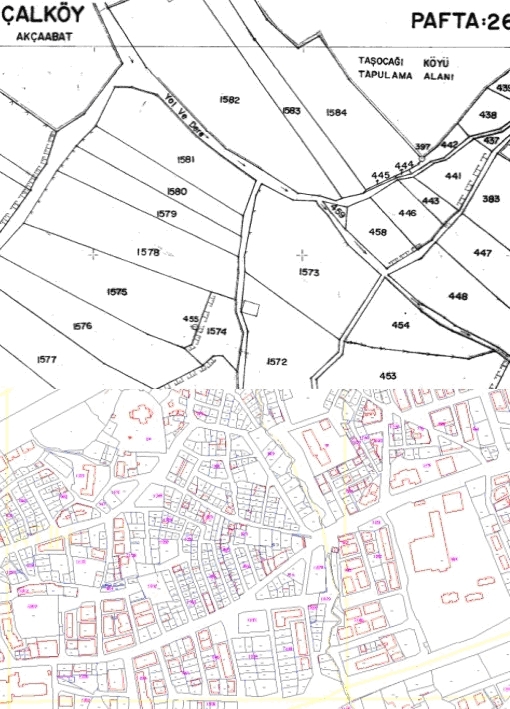 Some non-coordinated graphical cadastral sheets completed before cannot be transformed to the today’s requirements (in digital environment and coordinated). 3. There is no urban infrastructure map related with cadastral map largely. There is a third dimension (Z coordinate) measurement in legislation but not in practical. Providing reliable land information required for land and land-related activities and decision makers. Within the frame of the determined requirements, by taking advantage of the principles and possibilities of an Integrated Information System, planning, conducting and managing the activities of the General Directorate of Land Registry and Cadastre (TKGM) more properly more quickly, more reliably and more effectively. Regulating such activities in accordance to the principles of Geographical Information System and Land Information System, in frame of standards of OPENGIS Consortium. Transferring land register records and cadastral maps to a digital environment and to a database, modeled and created according to the requirements of TAKBİS. Maintaining information updated and re-evaluating them within the scope of information technologies and offering them to the use of central and provincial units of the TKGM and other public organizations. Providing a possibility to transform land registry and cadastral information into a Multipurpose Land Information Systems, through the use of such information by relevant organizations. Revision of the property system where the non-coordinated graphical cadastral sheets was done via land readjustment. The second cadastre studies for the purpose of renovation of these sheets in these areas. 3. In big cities, infrastructure measurements have been started in supervision of Infrastructure Coordination Center called AYKOME. Some services are provided to promote the cadastral survey. Some municipalities try to share the information of cadastral survey results including new survey in the municipal office by using GIS. It is necessary to promote the reasonable plan and carry out the cadastral survey properly.